Yes, it's 100% free, no catch. Our experts are all volunteers who enjoy sharing their knowledge and helping others. Expenses are paid by advertisers. Yes! Our step-by-step instructions use plain language that anyone can understand. No geek speak. Great! We also welcome discussion on how to keep your PC safe and secure. Do you want to learn about malware removal and how to help others? 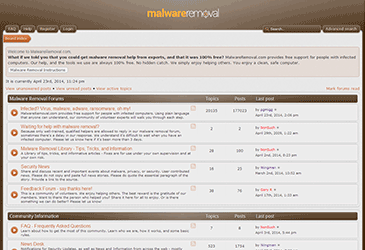 Our community will teach you about malware removal. How to support those with infected computers, and to never give up until the computer is clean and secure. Interested? Learn more. What if we told you that you could get malware removed by experts, and it was 100% free? Register Now, it's free and easy! Or, come in and look around!